Another flavorsome vegan recipe to add to your summer menu. 1. Sieve the gram flour into a large bowl with the baking powder, cumin, coriander, chilli, salt and turmeric. Mix well with 100ml cold water to make a batter. Add the onion and grated celeriac, and mix well with clean hands. 2. Warm a large non-stick frying pan over a medium heat. Add 2 tbsp of oil. Once hot, shape the batter into 6 flat burgers and fry for 2 minutes on each side until nicely brown and starting to go crispy. It is important that the burgers are shaped flat so they have time to cook through. Repeat until all the burgers are cooked, adding more oil if needed. 3. Whiz all the mayo ingredients except the oil in a blender until smooth. With the motor still running, slowly add the oil, little by little, until it forms a lovely, creamy mayonnaise. 4. Toast the burger buns. Add a generous serving of mayonnaise to the bottom of each bun and place a burger on top. 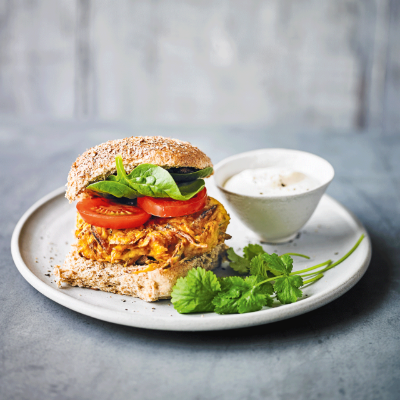 Add tomato slices, coriander and spinach, and a generous serving of sundried tomato pesto and/or mango chutney on the top of each burger bun. Sandwich together and serve. Any leftover mayonnaise will keep in the fridge for 1-2 weeks.